In a beautiful little village lived as a pretty feline. That feline was pretty good looking. The pretty feline was unexpectedly stuck in a room a day. It is your duty to save that pretty feline from there. You have to help save that pretty feline from there. 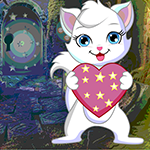 It will help you find the hidden puzzles and spells that are hidden there. All puzzles are correctly detected and the pretty feline that has been trapped there and you are happy to win the game. The trick in which the clues are a little difficult to trick, but somehow, it's a curiosity. And everyone is happy to play this game. Good luck and have a fun !